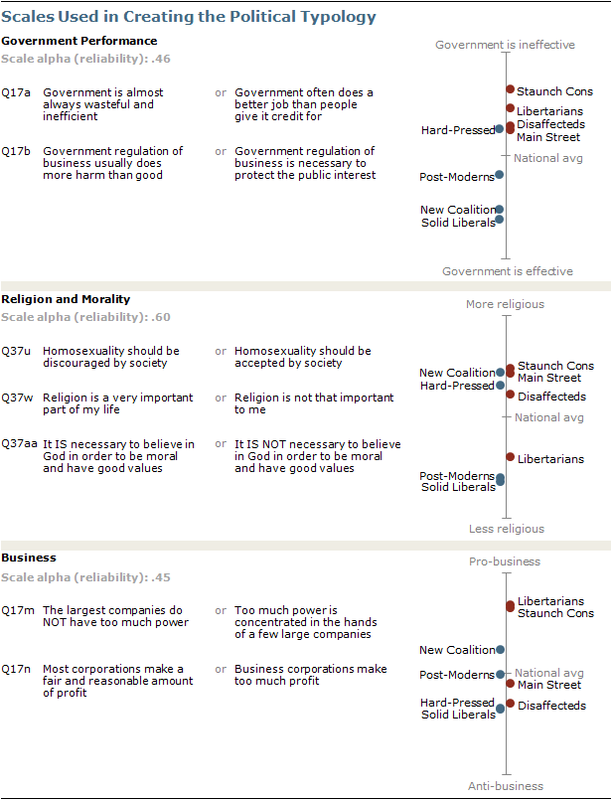 The 2011 typology divides the public into eight politically engaged groups, along with a ninth group of less engaged Bystanders. The assignment of individuals to one of the eight core typology groups is based primarily on their position on nine scales of social and political values – each of which is determined by responses to two or three survey questions – as well as their party identification. 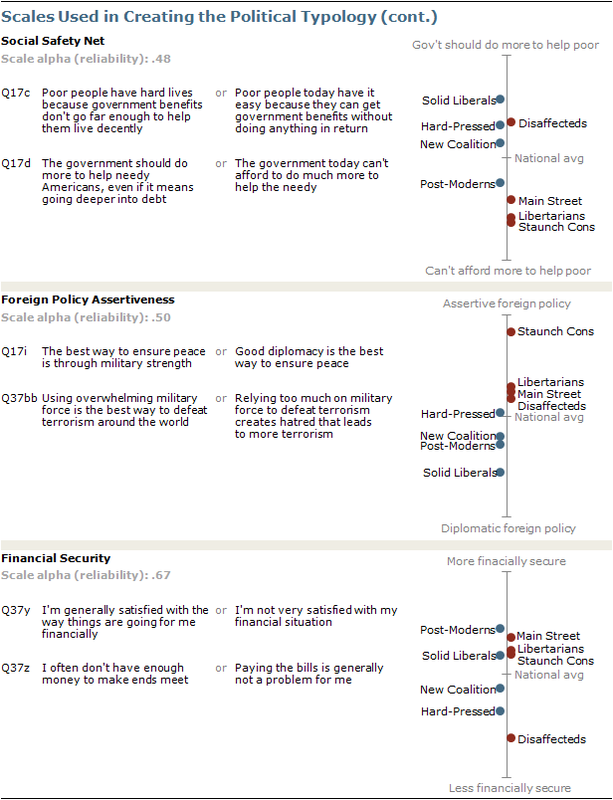 The questions used to create the value scales are in a balanced alternative format where respondents choose which of two statements mostly closely reflects their own views (Q17 and Q37 in the topline). Scales were developed using factor analysis and tests of scale reliability to select the questions most strongly related to the underlying dimension being measured. Many of these value scales are similar to those in past typology studies. However, each update of the typology starts with a fresh analysis of American values to reflect any shifts in the political environment. 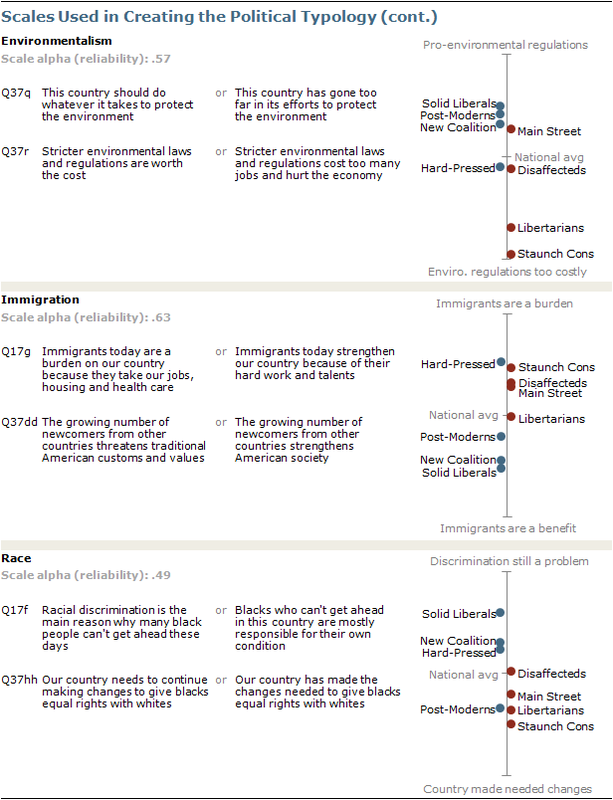 The typology groups are created using a statistical procedure called “cluster analysis” which accounts for respondents’ scores on all nine scales as well as party identification to sort them into relatively homogeneous groups. The tables on the following pages show each of the scales, its component questions, and the average placement of each of the eight typology groups (excluding bystanders) on each scale. Cluster analysis is not an exact process. Different cluster solutions are possible using the same data depending on model specifications and even the order in which respondents are assessed. Several different cluster solutions were evaluated for their effectiveness in producing cohesive groups that were sufficiently distinct from one another, large enough in size to be analytically practical, and substantively meaningful. While each solution differed somewhat from the others, all of them shared certain key features. The final solution selected to produce the political typology was judged to be strongest from a statistical point of view, most persuasive from a substantive point of view, and was representative of the general patterns seen across the various cluster solutions. As in past typologies, a measure of political attentiveness and voting participation was used to extract the “Bystander” group, people who are largely not engaged or involved in politics, before the remaining respondents were sorted into groups. Bystanders are defined as those who are: 1) Not registered to vote, 2) Say they seldom or never vote, and 3) Do not follow government and public affairs most of the time. They represent 10% of the overall population, and were held aside prior to scale development and assignment of the remaining 90% of respondents to their typology groups.